How much does it cost to travel to Tehran? How much money will you need in Tehran? ﷼2,639,217 ($63) is the average daily price for traveling in Tehran. The average price of food for one day is ﷼476,525 ($11). The average price of a hotel for a couple is ﷼4,197,434 ($100). Additional pricing is in the table below. These average travel prices have been collected from other travelers to help you plan your own travel budget. The capital of Iran, Tehran is a cosmopolitan city with great museums, art galleries, parks, restaurants, and more. It is located in the northernmost part of Central Iran at the foot of the towering Alborz mountain range. Some of the most popular attractions include the Treasury of the National Jewels, Golestan Palace, and the Tajrish Bazaar. And before you plan your trip to Iran, make sure you read these interesting travel tips about Iran. 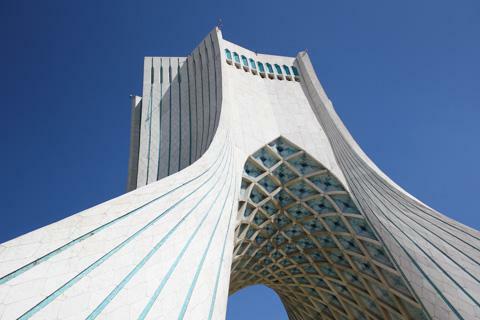 A longstanding symbol of Tehran and an iconic landmark is the Azadi Tower. Combining elements of Sassanid and Islamic architecture, the tower was constructed to commemorate the 2,500th anniversary of the Persian Empire. Another significant landmark, and the oldest of Tehran's historical monuments, is Golestan Palace. The complex consists of 17 palaces, museums, and halls, as well as a garden. Once the Qajars' royal residence, this place is one of the most visited sites in the city. Its museums showcase the best of culture, art, and history of Iran and its provinces. Also well sought out is the Treasury of the National Jewels, which showcases the largest collection of jewels found anywhere in the world. Highlights include a number of famous diamonds, the world's largest uncut ruby, and a free standing golden globe made from 34 kilograms of gold and over 50,000 precious stones. Other attractions include the Milad Tower which is visible from anywhere in the city, museums like the Tehran Museum of Contemporary Art and the Carpet Museum & National Rug Gallery, and the Grand Bazaar which features anything from clothing to carpets, kitchen accessories, decorations, jewelry, and more. The city can be roughly divided into two different parts: north and south. The northern districts of Tehran are more prosperous, modern, cosmopolitan, and expensive while southern parts are less attractive but cheaper. As a whole, Tehran is extremely populated and traffic-ridden, though there are also more than 800 parks throughout the city great for escaping the cosmopolitan smog and bustle. Some of the more popular neighborhoods for visitors include Niavaran, Farmanieh, Tajrish, and Zafaraniyeh. Niavaran is home to the wealthy with cultural riches such as the Niavaran Palace Complex, Niavaran Park, and the Farhangsara (cultural center) which includes an amphitheater, museum, music hall, and Café Galleriea courtyard coffee shop with indoor exhibition space. Farmanieh is also affluent with many skyscrapers and a shopping plaza. Tajrish is one of the oldest neighborhoods of Tehran and is perhaps best known for its traditional bazaar which features a vast array of local goods and handicrafts. Zafaraniyeh, a historical place of residence for saffron traders, is probably the most expensive in the city home to Embassies and Ambassadorial residences as well as the museum of Sa'dabad Palace. Sightseeing amidst the major attractions of Tehran occupies most of one's time during a visit to the city. There are plenty of features that showcase the best of Iran's art, history, and culture especially with the great number of museums, galleries, and monuments. For a view of the city from above, visit the observation lounge of Milad Tower. Or, to become immersed in the lively culture of the city close up, explore the many bazaars and markets of Tehran's unique neighborhoods. Meals in Iran are traditionally relaxed, drawn-out affairs with a range of dishes from pastries, fruits, and nuts to rice, kebab, soups, and flatbreads. Lunch can be served anywhere between 12-3 pm and dinner is often eaten after 8 pm. Alcohol is forbidden, except for some religious minorities, as are pork products. Rice is a staple for Iranian cuisine, often flavored with saffron and other spices, and served with kebab variations of chicken, beef, or lamb. Dishes are often garnished with grilled tomatoes, onions, and other vegetables and flavored with a variety of spices. The most popular Iranian soup is the vegetarian ash reshteh, made from herbs, chickpeas, and thick noodles, and adorned with yogurt and fried onions. Flatbreads are served at breakfast with herbs, feta cheese, and a variety of jams, or as an accompaniment to meals. To enter Iran, a visa is required for the citizens of all countries except Lebanon, Turkey, Malaysia, United Arab Emirates, Oman, Russia, Armenia, Georgia, Azerbaijan, Venezuela, Tanzania, Nicaragua, Bolivia, and Ecuador. United States citizens can apply for a visa at the Iranian Interest Section of the Pakistani Embassy in Washington; however, they must have an MFA-approved guide to accompany them for the entire trip as well as an exact itinerary prior to traveling (thus, tours are suggested for U.S. visitors).